We love fruit for dessert. One of our favorite recipes is fruit pizza, but I don’t always want to make one that is so large. I found a way to make a mini version instead! That way, I can create it when I want one and don’t have to worry about any of it going to waste. Some of our family’s favorite desserts are made with fruit. They are refreshing, but not overly sweet. 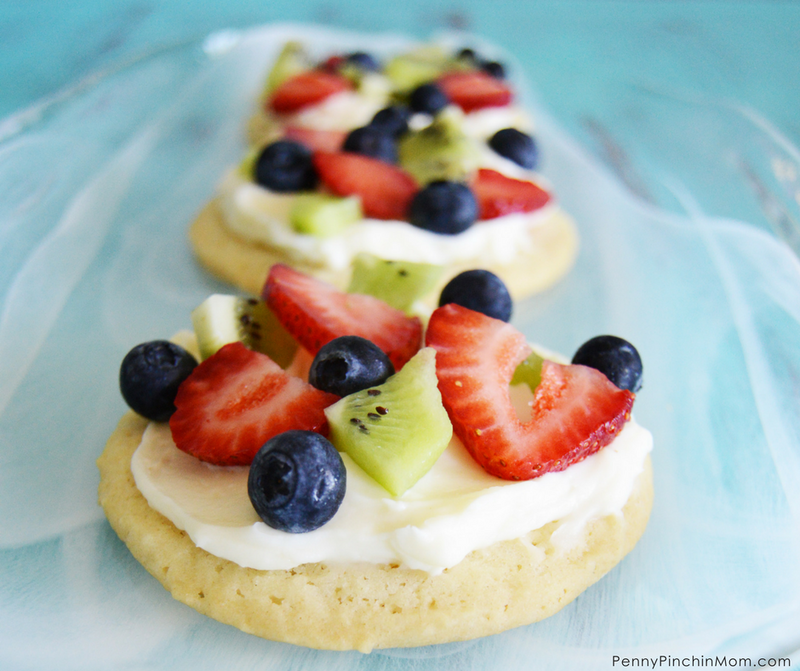 One of our favorites is fruit pizza cookies! We’ve made the larger fruit pizza sugar cookie in the past, but that the slices were a big large. In my effort to control portion sizes, I looked to a small sugar cookie. That’s when it hit me! Why not make mini fruit pizzas? I happened to be in a hurry that day and did not have time to make a batch of sugar cookies. I grabbed a roll of refrigerated sugar cookie dough from the store instead. Then, I whipped the spread and sliced up the fruit and created my mini desserts. Not only did I impress myself, my family was equally as impressed. Whenever I made the larger version, the cookie tended to get soggy after a while. But, I don’t have that issue with these. We grab a cookie for each of us and create the pizza when we want it. And, everyone gets to create their own style! My oldest daughter goes for the strawberries and kiwi. My son prefers sliced blueberries and my youngest grabs every fruit she can. It’s been a fun way to get them into the kitchen and creating something that is not overly sweet. A simple single-serve dessert idea that is perfectly refreshing. In a medium size bowl, use an electric mixer to blend the cream cheese, powdered sugar, and vanilla together until they’re smooth. Spread a heaping spoon of the cream cheese mixture on the top of the sugar cookies. Chop the fruit into small pieces. We used kiwi, blueberries, and strawberries. 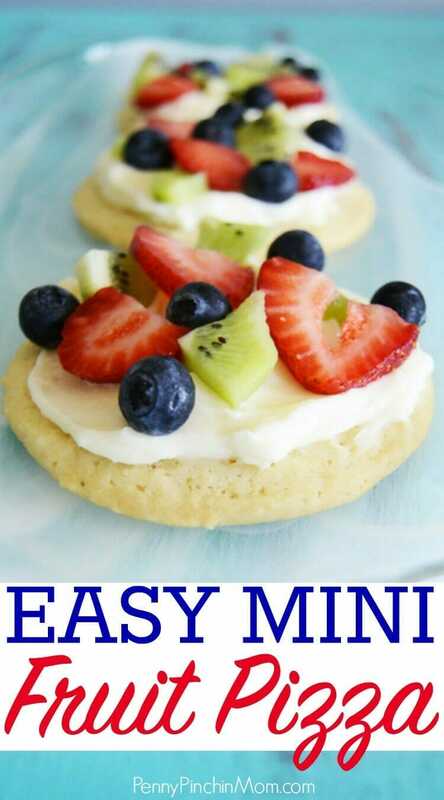 Top the Easy Mini Fruit Pizzas with the pieces of fruit. « Shutterfly: Ten FREE 8×10 Prints (Just Pay Shipping) – Today Only!